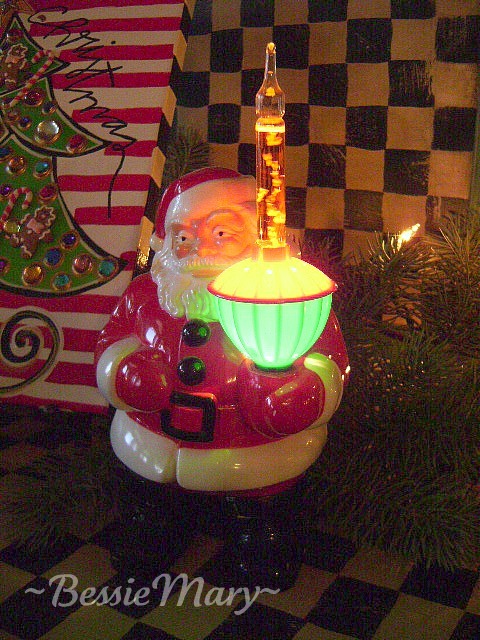 This jolly bubbling Santa used to always appear in Grandmother Bessie's living room window. It, and a wreath on the door, were the only decorations visible from outside her home. There were always more decorations inside, but this Santa was always my favorite. She made sure that I received it when he could no longer appear in her window. It was made by the Royal Electric Company of Pawtucket, Rhode Island. The price on the original box, although very torn and tattered, is $1.75! It is still one of my favorite decorations. Maybe because of all the memories it holds. Maybe because it always makes me smile. Maybe because it is simple - nothing fancy or expensive. Just plug it in and it starts bubbling over with joy! During the other eleven months of the year, this little Santa lives in a cabinet easily reached. I was so happy he was not up in the attic, and was able to take his usual position on the breakfast room hutch again this year. For several years, it was very difficult to find the bubbling bulbs. I stocked up when I finally found some. Now, this is my last one. Hopefully, it will keep burning brightly for many more holidays to come. The days are dwindling and I hope your To Do lists are, too! It's wonderful. This is what the season should hold for all of us, beautiful memories of special people and new memories to be created. I am a wife and mother. I am the granddaughter of Bessie and daughter of Mary: two women who passed down to me their love of needlework. Now, I see their hands and continue to feel their unwavering love and guidance with each stitch that my hands make. I love hydrangeas, peonies, poppies and periwinkle blue. There is a soft place in my heart for things showing age. Perhaps because I pray to still be cherished when I grow old. What has been keeping me busy! Just A Reminder...We Have Moved! Simple Joys of Christmas - Leftovers! I am honored if the content of my blog has inspired you. Please respect my photos and text and do not use them without consent, or appropriate credit and links. Thank you!